Disclosure: I received a free copy of the Whole Cooking & Nutrition Cookbook to create this Gluten Free Turkey Meatloaf recipe. I was not compensated for my time and as always all opinions are my own! It’s American Diabetes Awareness Month! 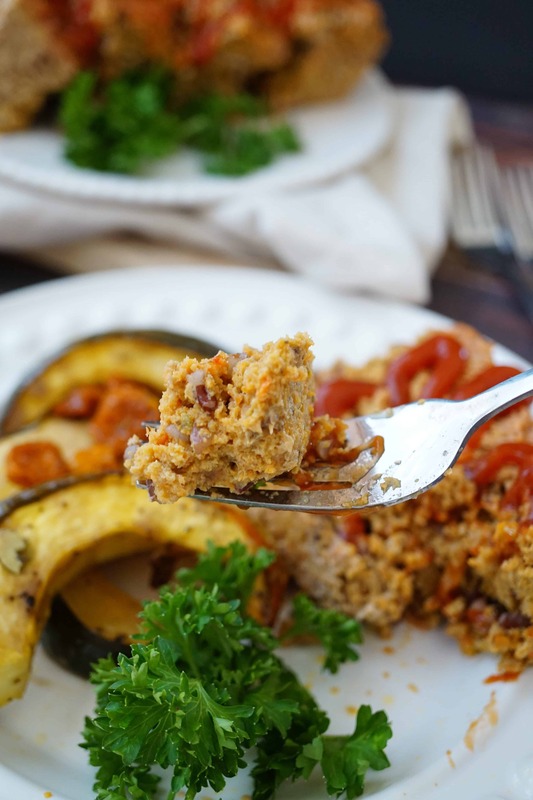 I’m honored to introduce to you today this Gluten Free Turkey Meatloaf, inspired by the wonderful Katie Cavuto and her latest cookbook, Whole Cooking and Nutrition. First things first, I want you to know how much I love this woman. 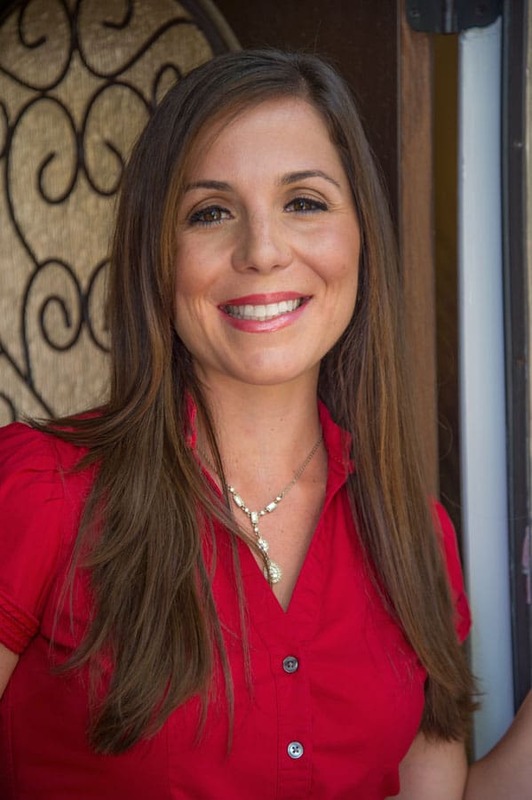 Katie Cavuto is seriously one of the most humble, sweet dietitians I’ve had the pleasure of meeting. We actually first met at the Fit Foodie Race last year in San Diego. She was working with one of her clients and did a culinary demo, creating the most delicious sandwich out of hearty whole grain bread. How she put together this amazing culinary creation using staple household ingredients was incredible! At that moment I officially decided she got my simple swap gold star and was elated when she asked me to review her latest book! Now, how did this Gluten Free Turkey Meatloaf come about after reading her Whole Cooking & Nutrition Cookbook? Well, Katie has an incredible Turkey and Quinoa Meat Loaf recipe in the book that I knew would be a winner in our house. But, at the time I whipped up this recipe I didn’t have quinoa and we had a plethora of fresh peppers from the garden. After reading through her book, I learned so much about the different ways you can add unique spices and herbs to make a recipe really your own. Seriously, it’s like a culinary fun bootcamp! Nevertheless, I knew the flavor profile could be altered slightly using the ingredients I had on hand but still keeping true in form her original recipe. Seriously, that’s why I love cooking! The great chefs behind these fantastic cookbooks give you the courage, inspiration and power to get in your kitchen and create your own unique twists on those classic recipes they share with you. 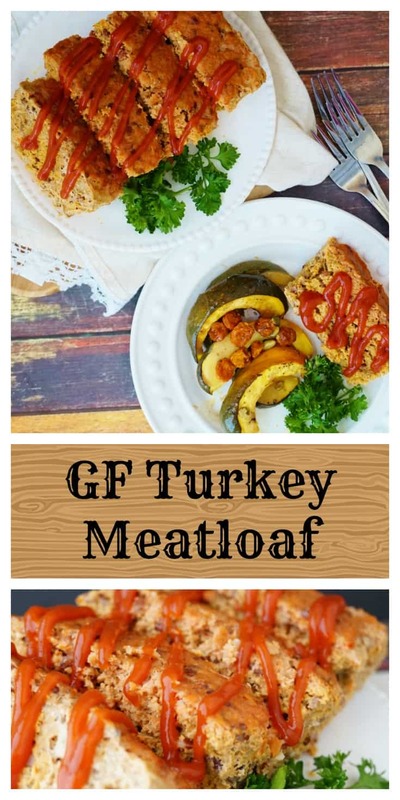 I highly recommend you first try out her original recipe, then give it a second whirl adding your favorite spices and herbs too, like this Gluten Free Turkey Meatloaf! 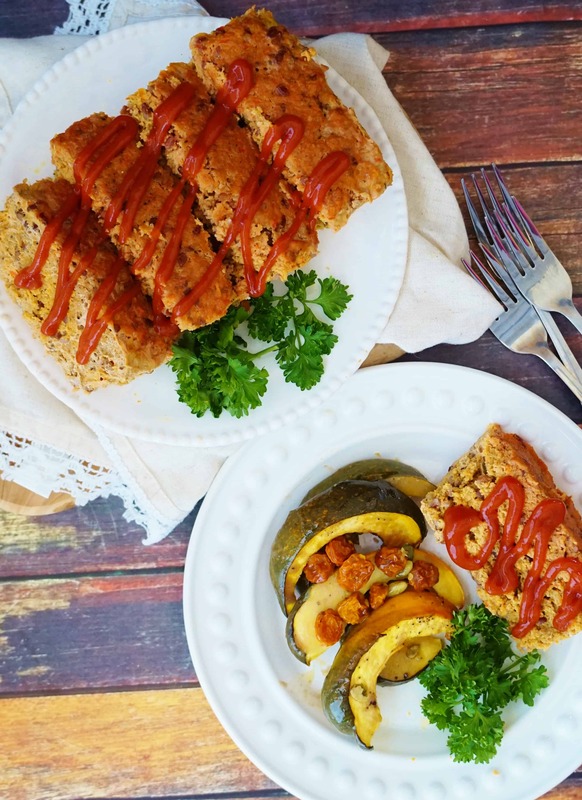 Gluten Free Turkey Meatloaf is a remake of your classic diner staple in a healthy way! 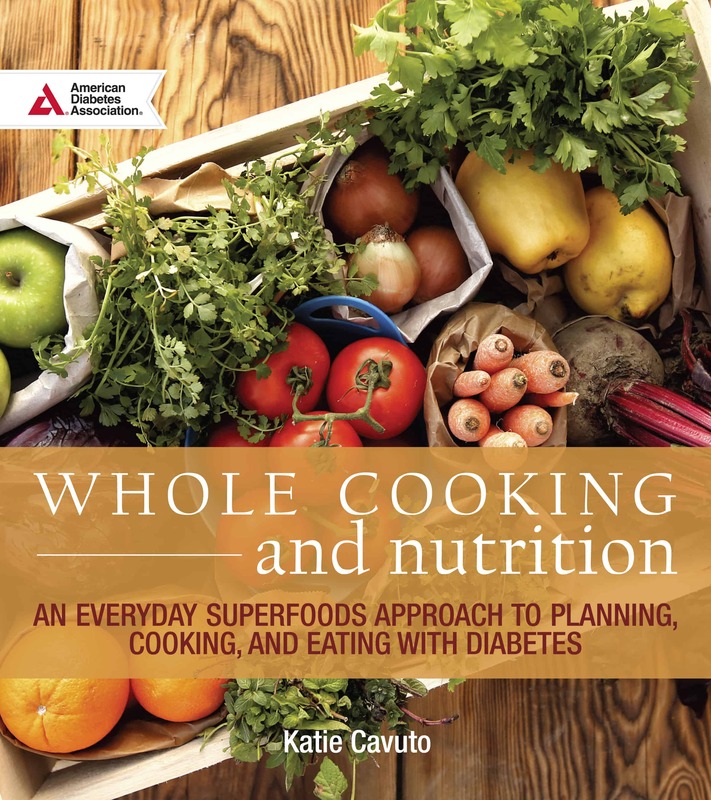 Inspired by Katie Cavuto's latest cookbook, I know this will soon be a winner in your house too! In a food processor, process egg, bell pepper, garlic, red onion, carrot, Thai chili and serrano pepper. Process until smooth, about 1 to 2 minutes. In a large bowl, combined pureed mixture with red rice, ground turkey and spices. Mix thoroughly together. In a 6 x 4 x 2-inch loaf pan sprayed with cooking spray (or a baking sheet lined with parchment paper), place turkey mixture and pat down. If using the baking sheet, form into a 6 x 2 x 2-inch loaf. Bake for 35-40 minutes or until the internal temperature reaches 165*F.
Remove from oven and let cool 10 minutes prior to cutting. Top with desired sauce of choice. Because Katie is just so amazing, she’s offered me the opportunity to share the Whole Cooking & Nutrition Cookbook with you! Plus, since her cookbook is American Diabetes Association approved, I figured it was the best way to kick off this month and help you continue to lead your healthiest life yet! Enter here to win a copy for yourself— good luck!! « Birthday Bucket List – How to Create a List to Conquer in 1 year! So true- Katie knows how to make magic happen in the kitchen! Such a great meatloaf recipe, love any recipe that you can sub some ingredients you have on hand into! It’s the beauty of recipe creation- I love it! Yay for cookbooks! That meatloaf looks all kinds of awesome–I’m going to have to try making it this weekend (I think I have almost all the ingredients to make it, or something like it depending on what I have lying around. 😛 ) Thank you for the giveaway! AWesome, thanks so much Farrah for entering! Let me know if you make it!!! This meatloaf looks amazing and would be perfect for a cold day. I love some healthy comfort food! I’ve made a few recipes from Katie’s blog and all of them were winners.. Thanks for hosting the giveaway! Thanks so much Katy for entering and your comment! I love Katie’s work too! You are entered to win my friend!! So many yummy veg recipes too! HELLOOOOOOO beauty!! 😀 Looks amazing! You are the best- thanks Sonali for the support! 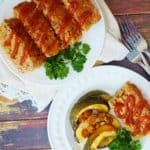 Love this healthier meatloaf! The cookbook sounds amazing. I need to look for a copy! It’s amazing!! I am certain you won’t regret it! Comfort food at its finest! I love the quinoa here – so creative!! And the flavour profile of this meatloaf would definitely be a winner with my family too. Woohoo! I am so glad you like it Rebecca! Hi Elizabeth, since I’m celiac am always looking for new gluten-free meals to add to my cookbook. Thanks to you, today I’ve added a new item into my not-so-big list. This recipe is very well explained and plenty of pictures to better understand the cooking process. I’m definitely giving this recipe a try. Thanks for sharing. Cheers! Thanks so much Jen! I hope you enjoy it! This meatloaf is so juicy and flavorful! Its one of my favorite recipes! Yay! this is gonna be the way I get Sam man to eat quinoa! So pumped! Love all the fresh flavor in this meatloaf! I’ve been searching for a delicious gluten-free meatloaf! This is perfect!